Today I attended a phenomenal event, one that has shaped the history of Houston, Texas since 1972 - the Houston Marathon. This Marathon has been around for 43 years and seems to grow in size year after year. This year alone, 25,000 people participated (12,200 men and 12,800 women)! 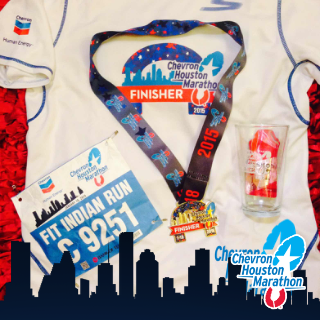 With over 200,000 live spectators, 7000 volunteers and millions of people watching on TV, the Houston Marathon symbolizes a Houstonian tradition that brings together an eclectic variety of people and this year, I got to be a part of that diverse crowd. The morning started off pretty customary. My Dad had left for the marathon at 5:30 in the morning, and my brother and I didn’t wake up until 9 (which was still early to me!). While driving to the Downtown Convention Center, we turned on the radio to find that someone had already won the Marathon! Yerbrgual Arage was the female finisher from Ethiopia with a timing of 2 hours 23 minutes and 23 seconds, and the male finisher was Birhanu Gedefa with a timing of 2 hours 8 minutes and 3 seconds ; also from Ethiopia - a very impressive feat! After picking up flowers, balloons and a card for my Dad, we went to the Marathon- and that’s when the real adventure started. We ended up getting a decent parking spot and had to walk a few blocks, which put us right in the vicinity of the finish line! The effusive and enthused crowd was cheering on runners as they crossed the finish line, and a rather jocular announcer was making comments as people were running. My favorite part would have to be the signs that people held up along the way. Some signs read, “Wow you’re actually paying to run this? ?” and “I only run marathons on Netflix”. It’s inspiring to see an entire community coming together to support a large group of running people! Kudos to the new technology and the Chevron Marathon App on my IPhone, I was able to track my Dad for the entire run. Soon we saw him crossing the 25th mile, and my brother, Mom and I began throwing our hands in the air waving and screaming for his attention. Unfortunately, he didn’t notice. It seemed he was engulfed in the euphoria of the roaring spectators near the finish line. (its ok Dad-we forgive you). After he crossed the finish line, we reunited, took pictures, and we all congratulated him on reaching a huge milestone! After the Marathon, I looked up some facts about it and was surprised to find that 350,000 Gatorade cups were used and that free beer was given to runners while they run! Also, the total number of estimated calories burned on Marathon day was estimated to be whopping 47,550,000 and over 1500 traffic cones were used to divert traffic! Overall, preparation and hard work really does pay off, and it felt great to see my Dad, who could barely run a block two years ago, complete a full marathon of 26.2 miles (42.2 km) – Non-Stop! Author credit goes to Shreetika Singh - a junior from Seven Lakes High School.